State College Magazine provides locals with relevant, interesting, and readable articles about life in and around Happy Valley. This month includes an article I wrote about bears. My inspiration for this story occurred while visiting our EMS CAUSE class when Buck Wilde stopped by and told the students about his bear encounters. Wilde’s moniker is the bear whisperer. Ursa was six inches away from his face. He could feel her hot breath as she frothed and huffed. He remained calm as she put her head between his legs and the camera’s tripod. “That’s OK, girl. Let me alone,” Buck Wilde soothed the female brown bear. On assignment in Alaska, his pepper spray was ready, but she was too close. He had learned from an earlier career in covert counterespionage operations to read body language and facial cues. Ursa’s face read distress. A conversation with a bear is not something most people do calmly, but Wilde is known as a bear whisperer. Sir David Attenborough, the BBC broadcaster and naturalist, gave him this moniker. For most of the past 27 years, Wilde has lived in Alaska’s wilderness. 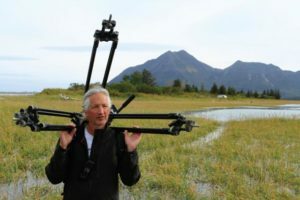 As an expert wildlife behaviorist, he joined a team of filmmakers in 2013 on the Great Bear Stakeout (co-produced by the BBC and the Discovery Channel). “A bear whisperer is someone who can communicate with a bear through body language—someone who has empathy and understanding and doesn’t see the bear mechanistically or believe it to be inferior,” he says. As Wilde uttered reassurances to the sow, he called upon all of his bear whispering skills. “I had been filming the mother and her three cubs for a week or so. I was all by myself, which is more dangerous, but she knew me. That’s when Ivan, a large predatory male showed up,” he explains. Ivan attacked the mother as Wilde continued to film for Grizzly Empire (scheduled to air in the U.S. on the National Geographic Channel). The footage shows Ivan grabbing and twisting Ursa by her neck. The cubs flee and run past Wilde. The mother was buying her cubs time to escape, according to Wilde. Male brown bears have been known to kill cubs for reasons that are not clear. The footage captures the mother breaking away from Ivan and coming right at Wilde to find her cubs. “Let me alone,” he said again. This is not a typical Central Pennsylvania scenario. Black bears, who live locally, respond differently from brown bears when threatened. If you live in Central Pennsylvania, you are likely to see black bears. Recently, an orphaned cub was rescued from a store parking lot, and a mother and her three cubs showed up in a Lemont backyard. The black bear population in Pennsylvania has quadrupled since the 1970s, with about 20,000 calling Pennsylvania home. Yet there have been no human fatalities from bears in Pennsylvania. “You’re more likely to get hit by lightning,” says Ternent. Ternent educates the public on how to minimize human and bear conflicts. Last year there were approximately 5,500 nuisance bear complaints, defined as when a wildlife conservation officer has to take some action, such as a visit or phone consultation. “Half of all the nuisance bear conflicts involve garbage or bird feeders. Our nuisance complaints are preventable. We don’t have a shortage of habitat,” reports Ternent. This is an important point: We have enough space to coexist peacefully. A few easy changes in our behaviors can eliminate most conflicts. For example, Ternent suggests taking your bird feeders in for the summer beginning on March 1. Most bird experts agree it is not necessary to feed birds during the warmer months, and some suggest that it’s beneficial not to feed them all year. Young birds need to develop skills to find food. Also, because black bears eat almost anything, including human food, keep your garbage in a place that will not invite bears into your living space. Wilde suggests making sure your voice doesn’t sound high pitched like prey. Use a deep, serious tone. In the unlikely event that a black bear charges, knocks you down, and attacks you, Ternent and Wilde advise you to fight back. Black bears usually run away, so you’re dealing with an abnormal predatory situation. Going limp and playing dead might work with a brown bear, but it is not the right strategy with a black bear. Black bears run from threats; brown bears eliminate them. “Let me alone,” Wilde said once again to Ursa. He was no longer filming. His camera pointed up toward the heavens, he’s focused on living. You can hear only his voice. “Go get your cubs. They’re not here,” the bear whisperer said. This entry was posted in EMS Activities and tagged bears, wildlife, writing articles. Bookmark the permalink.